Yeah so in keeping with the theme sparked off by Shane Meadows’ new rockumentary on the reformation of the Stone Roses, I thought I’d look back at a few music-themed favourites. With so many to choose from spanning so many styles within the genre itself, we’ve divided them up over five key categories – providing one top pick and four essential others. 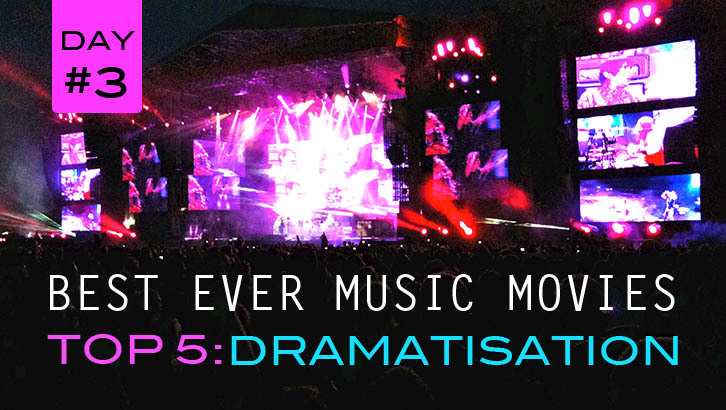 We’ve already covered Concert Films and Documentary, and follow today with Dramatisation, with Artistic and finally Comedy coming next. With each one I’ll offer a quick definition of how I’ve classified them, so hopefully you’ll sympathise with the choices made! Definition: A fictionalised story based on a band or musical event, often described as a biopic when focused on a particular artist. This may also include dramatic screenplays starring a known artist in a central musical role, but not necessarily as themselves. Anton Corbijn’s dense and intense biographical story of Joy Division frontman Ian Curtis (2007) is more about personal turmoil than the music. Visually brooding thanks to the stylish decision to film entirely in black and white, a tale which most will know ends in the singer’s suicide still skilfully manages to inject humour. This very human approach is therefore what sets Control apart, studying the difficult dichotomy of simultaneously chasing and running from fame. Curtis’ humdrum and dreary life in the English northern town of Macclesfield becomes both suffocating and safe, when his career with the band takes off. Married off with children hopelessly young, his subsequent struggles with infidelity, epilepsy and looming US tours close in with dramatic effect. 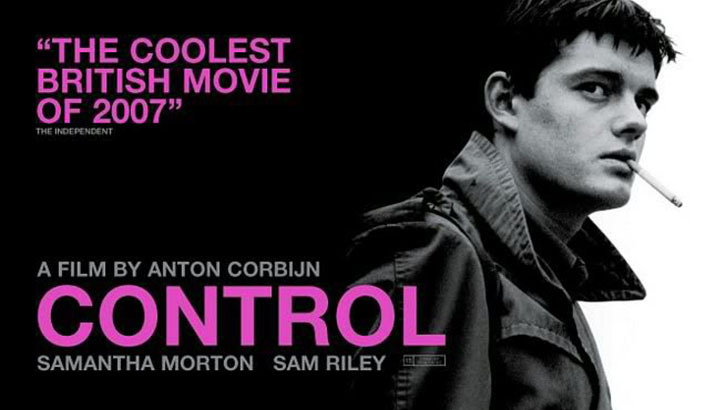 The overall tone of the film expertly encapsulates the bleak relentlessness of Joy Division beautifully, with notably convincing performance sequences from central star Sam Riley. What’s more, anyone with an appreciation of the Manchester music scene that emerged in the wake of Curtis’ death will delight in a supporting cast of characters such as Factory Records empresario Tony Wilson and Producer Martin Hannett. 2) Nowhere Boy – A 2009 John Lennon biopic from Sam Taylor-Wood that takes a refreshing angle on Beatles mythology by almost ignoring it completely. 3) Purple Rain – Prince stars in a fictional reworking of his life, providing a bombastic 80s-styled vehicle for his considerable talent and considerable ego. 4) Walk the Line – James Mangold’s 2005 retelling of Johnny Cash’s life and career features breathtaking performances from Joaquin Phoenix and Reece Witherspoon. 5) Crossroads – Not the Britney flick but almost as bad, this 1986 film from Alien co-writer Walter Hill at least shows ambition by taking inspiration from legendary bluesman Robert Johnson. Made of Stone was great and I’m sure international Roses fans should get some kind of release, although I suspect it’ll be DVD only. The film hits UK cinemas June 5th and a DVD release seems set for October. I might have to get you a copy and mail it over! Seeing them live at Finsbury Park this Friday though, can’t wait for that.